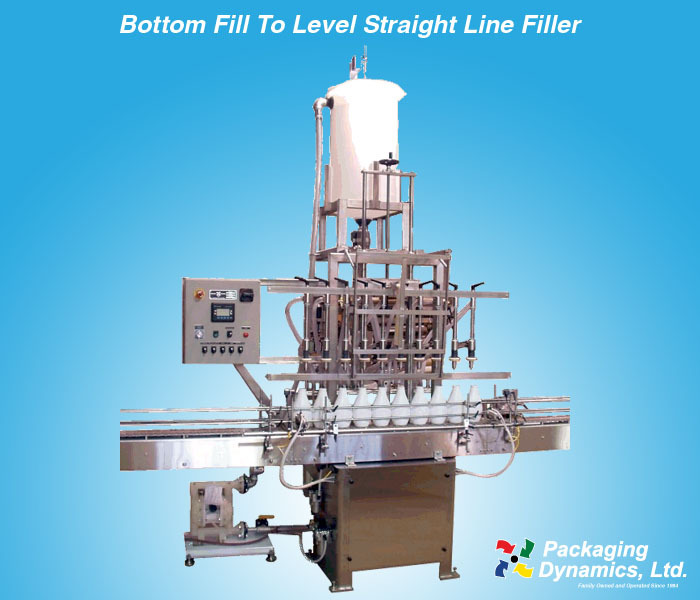 Bottom Fill-To-Level Straight Line Filler - Packaging Dynamics, Ltd. Designed for Products that Foam! 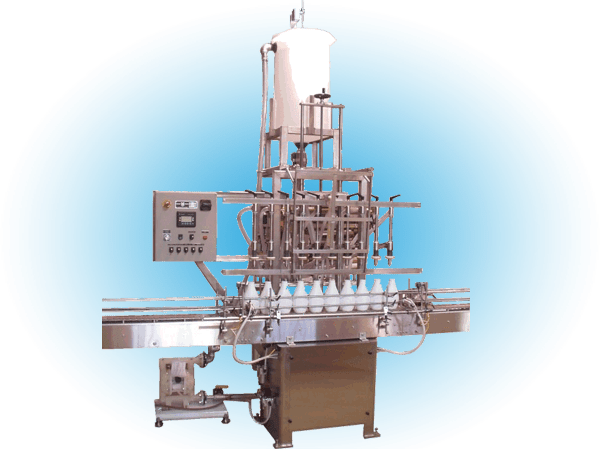 The Packaging Dynamics, Ltd. Bottom Fill Straight-Line Fill to Level Liquid Filling Machine is available in Automatic and Semi Automatic versions. A proven state-of-the-art machine which features diving heads and special nozzle ports to keep product foam to a minimum and engineered to have the flexibility of filling containers as small as 4 oz and as large as 2 1/2 gal (F-Style) at rates as high as 60 containers per minute. The Automatic version includes a product pump, reservoir, pressure manifold and a variable speed 10 foot conveyor and drive system coupled with photo-optic sensors which communicate machine status to the PLC. Automatic In-Gate and Out-Gate cylinders are provided that control container flow into and out of the filling station. Semi-Automatic version provides a roller or slide plate conveyor with timers and head activation switch, a product pump, reservoir and pressure manifold. The ease of operation provides for a minimum down time during change over. The model above shows a combination pressure/gravity setup. Custom line layouts and complete line integration are also available!